Target date funds are mutual funds that are professionally managed with asset allocations and risk profiles set to change along a glide path reflecting your target retirement date. For example you would be buy a 2040 target date fund if you expect to retire around the year 2040. Or put another way, Bill who is 35 currently and plans to retire at age 65, would buy a 2045 target date fund. The funds are built for investors who expect to start gradual withdrawals of fund assets on or shortly after the target date, to begin covering expenses in retirement. The principal value of the funds is not guaranteed at any time, and will continue to fluctuate up to and after the target date. Generally target date funds are offered in 5 or 10 year increments and are meant for investors who don’t have the time or expertise to manage their own investment asset allocations. Target date funds became popular after the Pension Protection Act of 2006 indicated that target date funds could be good default options for 401(k) plans. 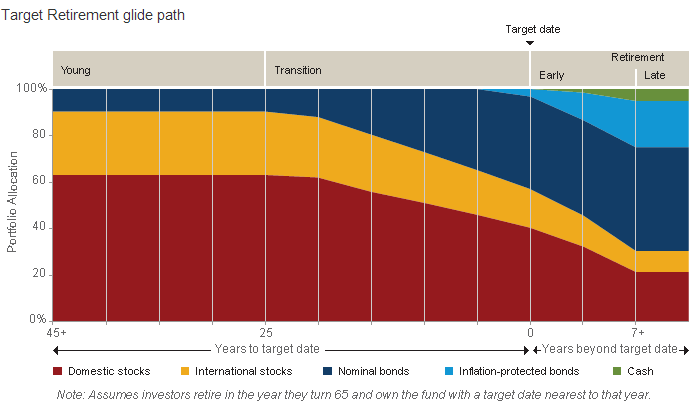 Target date funds came under criticism during the financial crisis, primarily because people misunderstood the purpose of the funds and the potential correlation of asset classes in a down market. However as longer term returns have shown, target funds have held their own when it comes to index funds and other more actively manged retirement fund strategies. Asset allocation: the allocation among various asset classes can be different from fund to fund. Quality of Underlying Funds: evaluate the quality of the funds used by the target date fund Are they mediocre, or do they have a reasonable performance track record when compared against their peers and industry benchmarks (like the S&P 500)?